With the arrival of warm weather, everyone wants to be outside. While I was driving around this weekend, I smelled so many bonfires. My nephew was super excited to report that they had their first campfire of the year. S’mores are the summer desserts that go hand in hand with fires. All summer long, we have graham crackers, marshmallows and chocolate bars on hand so that we are ready when the mood strikes. 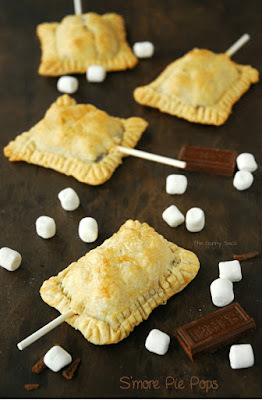 This S’more Pie Pops Recipe has a flaky pie crust instead of the graham crackers. I though about putting a graham cracker inside each pie on a stick but my kids didn’t want me to so I left them out. Cut a 4.4 oz XL Hershey’s chocolate bar into segments.